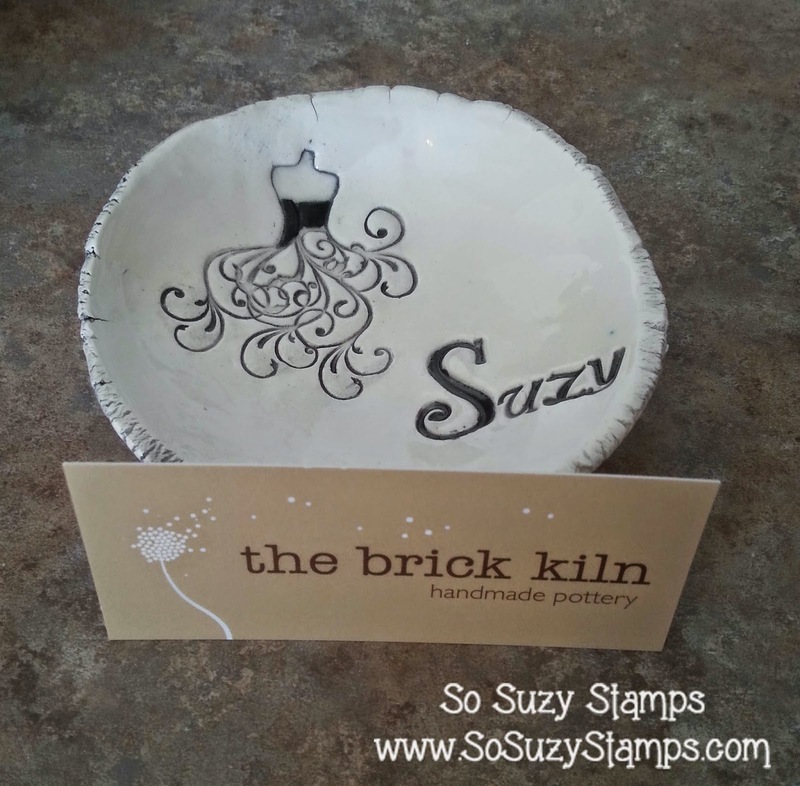 Last year, I had a wonderful request from Karen Guethlein at The Brick Kiln, she wanted to see if I could create a smaller version of our Wedding Dress stamp so she could use it on some pottery. I made a couple of phone calls and we were off to the races! Karen runs her pottery shop from her home in the beautiful mountains of north Georgia. All of her pottery is fired on one of two kilns in her home, one of which is 50 years old and was her husband's grandmothers! (How super cool is that?!) 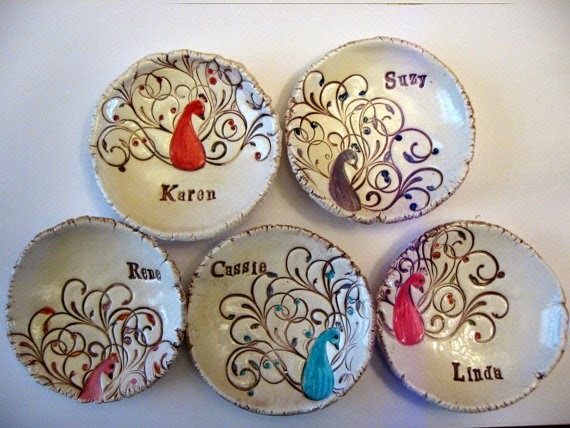 She also creates these fabulous little dishes for Anthropolgie! So, can I just say although I knew the wedding dress was in good hands, I never in a million years imagined how STUNNING this project would turn out! and they make the best bridal party gifts! I love how the Skittles look in my dish! Needless to say, when she asked about Phineas being put onto a similar style of dish I just about jumped out of my skin! My little fingers happy danced themselves all over the keyboard replying to her email. Woo hoo! Now, imagine my UTTER DELIGHT when I received a message from her this past weekend with a picture of dear Phineas all dolled up and ready to party! You can have your name on one too! I love how she made made some of them centered and off set! I believe the Karen and Suzy dishes are my favorite in the way of the layout! I am definitely a purple girl so I HAD to have one in purple, but the Turquoise is my shop colors so, ummm, I may have had to order one in Turquoise too! 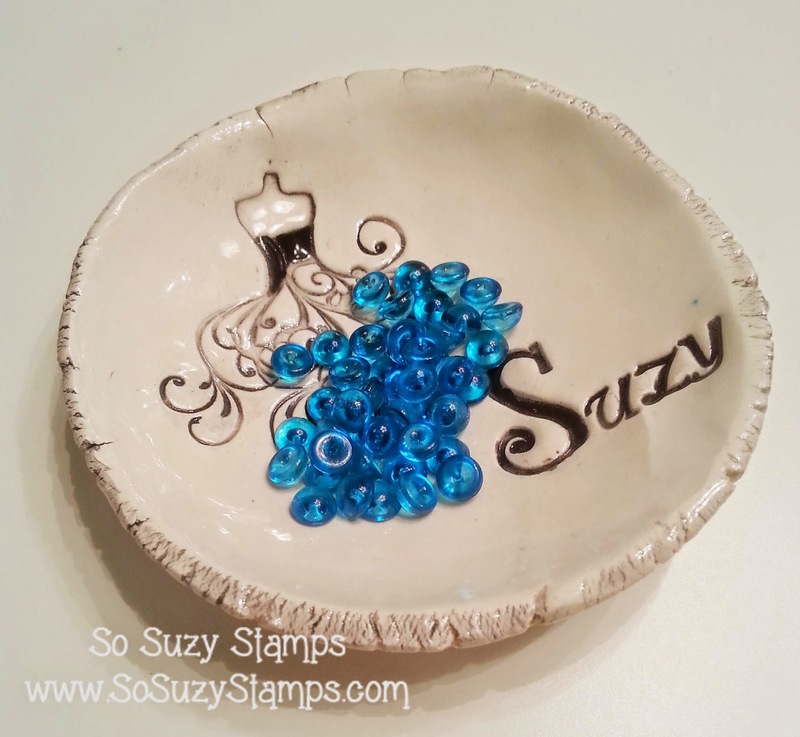 I just love how Karen took a rubber stamp and used it for something fun and different like ceramics! I wouldn't have thought it possible if I hadn't seen it for myself! 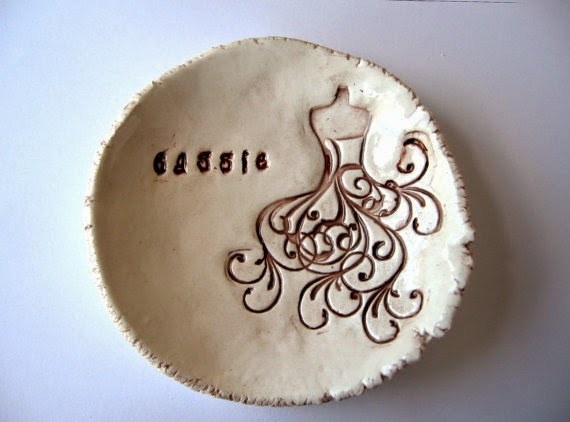 You can find her wedding dress dishes on her Etsy site...Wedding Dress Dish. Next time you are getting ready to break out your stamps, think about what other medias you can use to create something fun, special and out of the box! Beautiful! 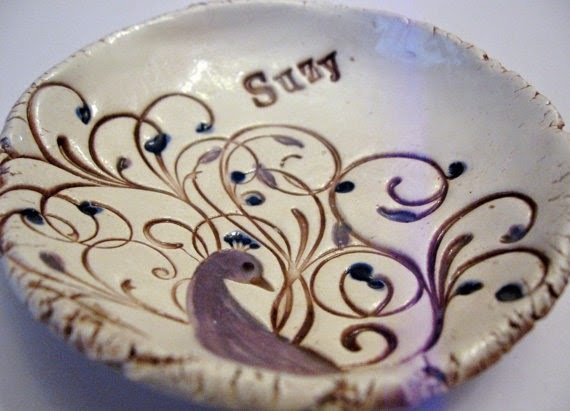 I have never stamped on pottery before...Hmmm might need to try. I would agree! They turn out so cool! I think I will hire you to do my PR work Suzy! thank you! what a wonderful spot on your blog and I am very honored to be here. It is easy when the dishes look so darn cute!!!!! Thank you so much!